It's beginning to look a lot like Christmas around here--beginning with the mantels! Our living room is at the center of our home, and this is the hearth that we gather 'round each night as well as on Christmas morning. 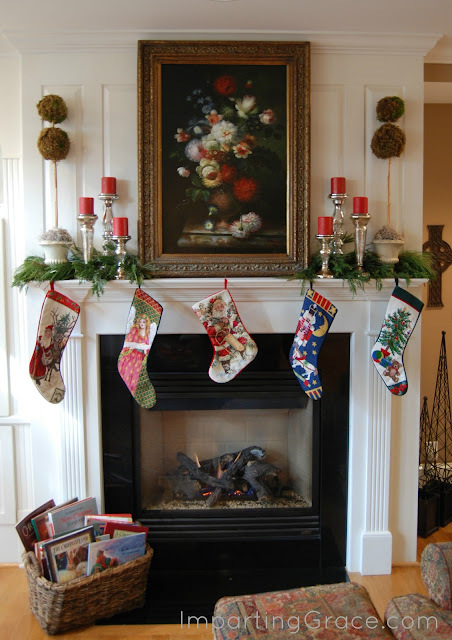 As usual, the stockings are hung by the chimney with care--Dad's, Mom's, Will's, Preston's, and Lee's. These stockings have been with us a long time--this is the 22nd Christmas that Will's has hung by our fire. Preston and Lee tease Will that his is the only stocking that faces left. I must admit that it's nice that the one odd stocking goes in the middle of the group. I've recently realized that it's not very fashionable to keep the central art above our fireplaces the same no matter the season, but I've also realized that I'm not particularly fashionable anyway. I'm more of a traditionalist, and my mantelscapes reflect that aspect of my personality. The mantelscape is completed with fresh greens and two of my DIY moss topiaries for added height. And, of course, our basket of Christmas books. Even though my boys have outgrown these books, they still get a kick out of picking them up and looking at them once a year. And I still cry when I read The Crippled Lamb or The Legend of the Candy Cane. We're doubly blessed to have two fireplaces in this house. The second one is in Jack's study. 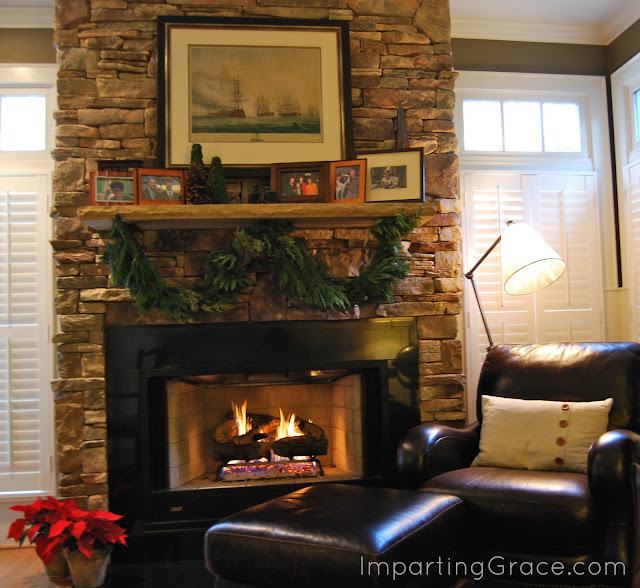 This room is very masculine, with its stone fireplace and nautical art, so I keep the seasonal decor here very simple. Don't you just want to curl up in that chair with a good book? This year I made a couple of moss-covered trees for this mantel and placed them with a large pine cone I found in our yard. I added a fragrant garland and a couple of poinsettias and called it good. I love this cozy room! How's the decorating going at your house? Absolutely lovely and cozy and Christmasy. I want to curl up in Jack's study with a cup of hot cocoa. : ) Christmas decorating here is going slowly...but it's going nonetheless. We pruned our too-big tree enough that it finally fits. And tonight, we hang ornaments. And drink hot cocoa of course. I love both of your mantels! I have been dying to switch mine to a stone one and now that I see yours, I am really going to push my husband for that! 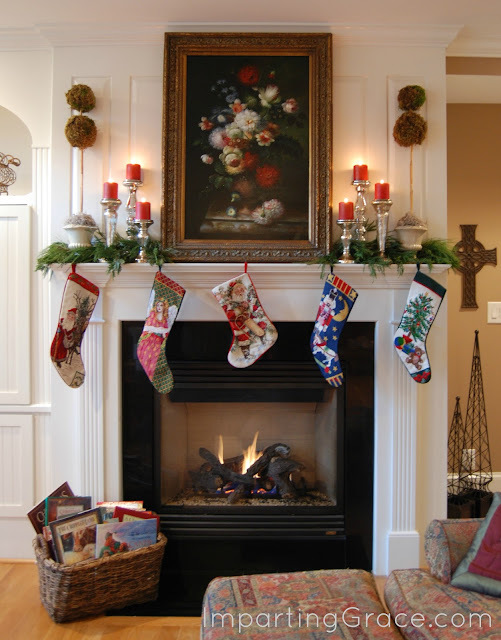 The white fireplace looks so elegant and I think it is cute the way one stocking faces the other way. Love the books the basket too! Love the mantels. And especially love that frame on the white mantel... all so pretty! Sarah, I just don't think you can beat Christmas books! But they do always make me cry! So pretty Richella! I can just imagine curling up with one of those books & my kids by the fire! Love both...I am a traditionalist also and just love your simple and elegant look. So warm and inviting! I seem to remember commenting on this last year, but we have some of the same stockings! My mom still puts our childhood books for Christmas out. Such a great way to bring back Christmas memories. 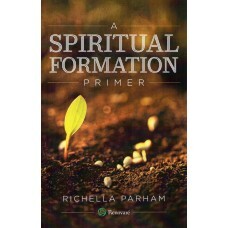 Very pretty, Richella! I think you've managed to decorate both mantels in a way that suits their style perfectly. The one in your husband's study looks so cozy, especially with that chair next to it. All finished here, but really enjoying my own home and all the ones who are showing up in blogland, including your lovely home! 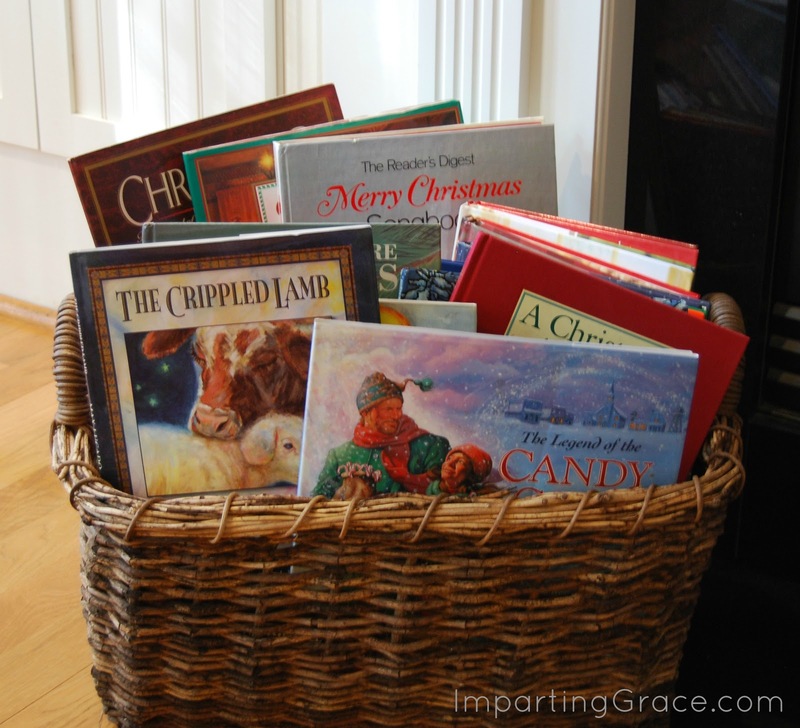 Our basket of Christmas books is one of our favorite things, too. daily. I'd like to start a blog so I can easily share my personal experience and thoughts online. Please let me know if you have any kind of recommendations or tips for new aspiring blog owners. Thankyou! 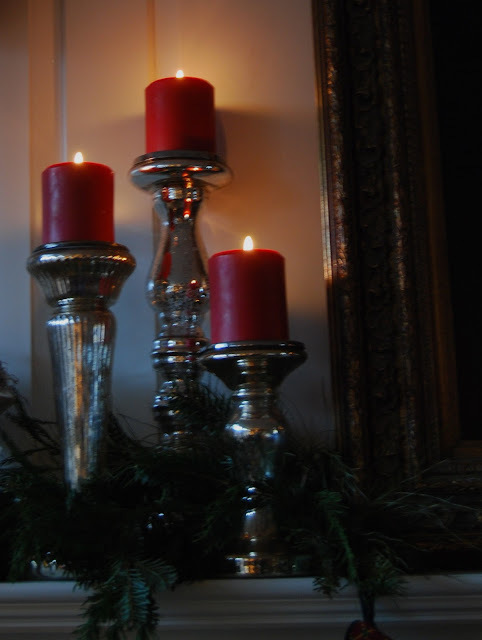 Love your mantels and I really love the mercury glass candlesticks! 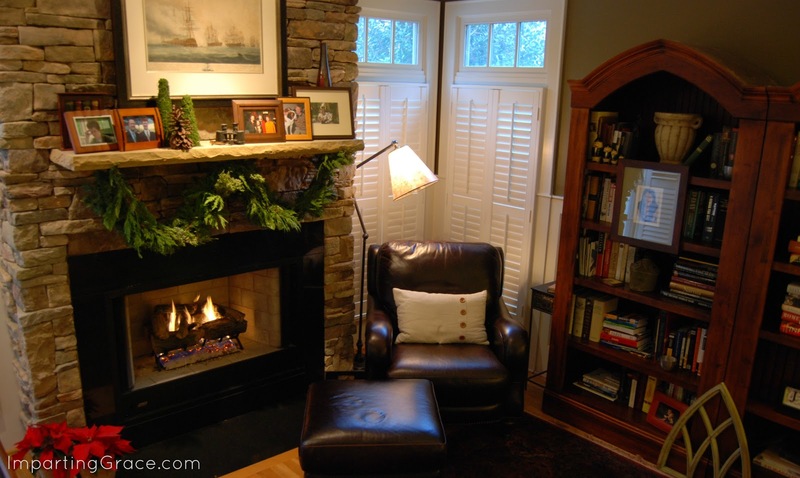 And yes, that chair in his study does look comfy enough to curl up in with a great book - and a hot toddy, too!! Jack's study is just my style! That chair is CALLING MY NAME! So simple and gorgeous. Richella, both displays are gorgeous! You have such an eye for decorating! Very pretty! That painting above the fireplace is gorgeous!